World-renowned engineers, Rolls-Royce, is ready to build the first of its new generation Trent 7000 engines, with key parts expected to be manufactured at its £110m Rotherham facility. The most advanced turbine blade casting facility in the world was officially opened on the Advanced Manufacturing Park (AMP) in Rotherham earlier this year. When fully operational in 2017, the 150,000 sq ft facility will employ 150 people and have the capacity to manufacture more than 100,000 single crystal turbine blades a year. These blades will feature in a wide-range of Trent aero engines. The majority of modern widebody aircraft, either in service or on order, are powered by Rolls-Royce Trent engines. 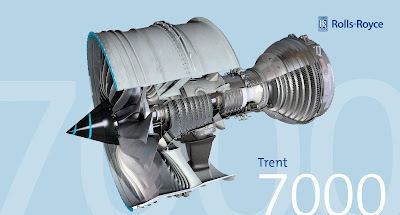 Combining previous work developing the Trent 700 - the engine of choice for the current A330; the Trent 1000; and the Trent XWB - the world's most efficient large civil engine, the new Trent 7000 will improve specific fuel consumption by ten per cent; have twice the bypass ratio; and will halve perceived noise. The engines will contain turbine blades manufacturing in Rotherham at Rolls-Royce's Advanced Blade Casting Facility (ABCF). "Grown" in a special process which ensures that they are created from a single metal crystal to maximise their strength, these SX blades generate the power of a Formula 1 racing car. The temperature within the high pressure turbine is 1,700 degrees centigrade, hotter than the melting point of the turbine blades themselves so they have to be coated with a special ceramic and cooled with air passed through the discs and out of a series of precise holes in the blade. Eric Schulz, president – Civil Large Engines at Rolls-Royce, said: "I'm proud that we are starting a journey to deliver the latest addition to our Trent engine family. The Trent 7000 offers a step change in performance and economics, and I look forward to the engine's first test bed run later this year." At the Paris Air Show last week, Rolls-Royce, announced that Ethiopian Airlines has decided to take Trent 1000 engines and long-term TotalCare support worth $500m to power six Boeing 787-8 Dreamliner aircraft. It was also announced that Italian carrier Neos will become a new operator of Rolls-Royce Trent 1000 engines, which will power three leased Boeing 787-8 Dreamliner aircraft.